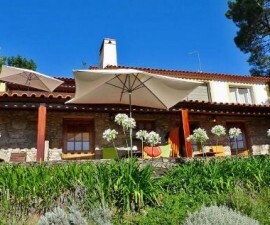 The Quinta de Santa Barbara is set in a historic farm building in a delightful rural location two kilometres west of Santa Barbara in the Ribatejo region of central Portugal. It provides the ideal base from which to explore the local countryside and gives easy access to the many historic and cultural places of interest such Fátima, Abrantes and the UNESCO World Hertigage Sites of Tomar. The building was originally built in the 15th Century and was at one time owned by Francisco Sampayo e Mello who was a friend of Camões, Portugal’s most renowned poet. It later passed to the Jesuit Priests who used it as a farm until the mid 18th Century. Having laid in ruins it was acquired and painstakingly restored by the present owner in the 1970s. Today it forms a lovely rural guesthouse close to Tomar, with views over the rolling hillsides swathed in eucalyptus and pine trees. The Quinta de Santa Barbara offers one double room and four twin rooms all with en-suite bathroom and air conditioning, and two suites known as the Main Suite and the Chapel Suite. The Main Suite has a large bedroom, large private living room with fireplace for open fire and its own television while the Chapel Suite has a Queen-size bed with fireplace in the bedroom, a living room and private access to the chapel. 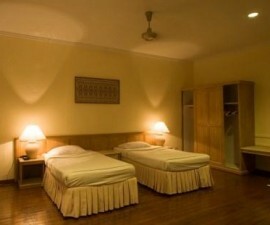 Most of the rooms can take a baby’s crib and some can accommodate an extra bed on request. The Quinta de Santa Barbara has several spacious living rooms including a TV room and a comfortable breakfast room with open fireplace, where freshly squeezed orange juice from the on-site orchard is served daily along with a hearty cooked breakfast. The hotel is presented in traditional style throughout with lots of exposed stone, heavy rustic furnishings and draped textiles, resulting in a fun, dramatic and quintessentially Portuguese ambience. This is particularly apparent in the cosy restaurant and bar. The restaurant is open from Tuesday to Saturday for lunch and dinner and is recommended for a feast of traditional Portuguese fare using fresh, local ingredients. The spacious gardens are enhanced by the lovely rural landscape and there is a large swimming pool with sun loungers that provides a focal point for guests. Further afield there are excellent opportunities for hiking, mountain biking and water sports and horse riding is available at the equestrian centre. 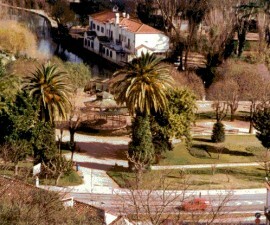 The local village of Constância offers canoeing in on the Zêzere River, which can be organised by the hotel staff. Head to the Almourol Castle, in the middle of the Tejo River or the Convento de Cristo at Tomar for a taste of the area’s historic sites.